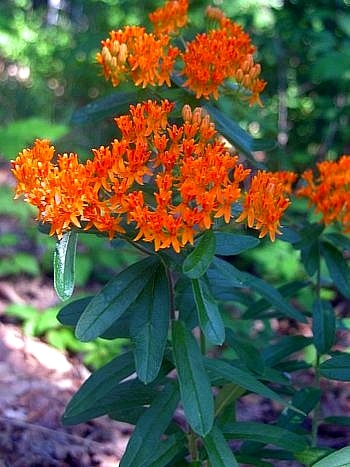 Botanical name: Asclepias tuberosa L.
Foliage: Stem is hairy; leaves are alternate, up to 5 inches in length, stiff, narrow, and often wider at the base. Sometimes the leaves are opposite near the inflorescense. Flower: 1/2", 1/2". Inflorescense is terminal and axillary umbellate cymes with approximately 25 flowers. Flowering time: Flowers June to September. Fruit is a pod with tiny seeds, each attached to a tuff of silky hairs. Wind-dispersed. Misc. USDA lists as UPL, usually occurs in uplands. This is the only milkweed with alternate leaves. Medicinal Uses: Root was used in 19th century for lung problems, as a purgative, and was applied to sores. 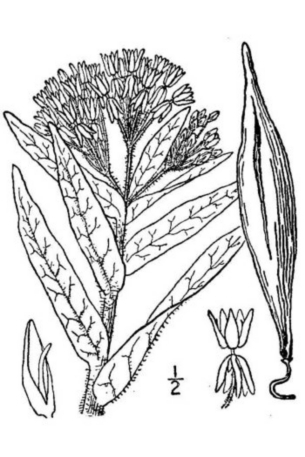 Asclepias tuberosa contains cardiac glycosides which are toxic in large amounts.